I'm really enjoying being back in the kitchen and cooking dishes that take our tastebuds around the world this week. For tonight's dinner, we headed to... Britain! What? Did you read the title of the dish and think India? Technically, the dish is Indian inspired, but believe it or not, Chicken Tikka Masala is considered the national dish of Britain. It's also one of my favorite dishes to order when dining out at Indian restaurants! If there's an ethnic cuisine that intimidates me, it would easily be Indian. The comprehensive list of various spices in many Indian recipes I've seen prevents me from even attempting to tackle it in the kitchen. But then I came across the following recipe in a Cook's Illustrated magazine I had stashed away. Looking at the recipe, I was surprised to see how approachable it is... even moreso when I had all the ingredients on hand. I made a few minor substitutions and adjustments and the final dish rivaled the versions I've tried at local restaurants. Even my husband agreed and I have no excuse to make more Indian inspired dishes at home. The chicken is extremely flavorful and so moist/juicy, thanks to the yogurt it marinates in. The masala sauce is a beautifully rich sauce that is spiced perfectly without being too spicy but with a hint of sweetness. I served this dish over garlic fried rice which complimented the chicken tikka masala perfectly. Note: I prepped this recipe in advance so it would be easy to complete and serve on a weeknight after a long day at work. The directions below reflect that and I believe the end result is much better preparing it as written below so the flavors to really shine. For the chicken, combine cumin, garlic powder, cayenne, and salt in small bowl. Sprinkle both sides of the chicken with spice mixture, pressing gently so mixture adheres. Place chicken in a baking dish, cover with plastic wrap, and refrigerate for 30 to 60 minutes. In large bowl, whisk together yogurt, oil, garlic, and ginger. After the seasoned chicken has 'marinated' for 30-60 minutes in the fridge, pour the yogurt mixture over the chicken and toss to fully coat both sides. Cover with plastic wrap and refrigerate for 6-8 hours or overnight. For the sauce, heat oil in medium sized saucepan over medium heat until shimmering. Add onion and cook, stirring frequently, until light golden, 8 to 10 minutes. Add garlic, ginger, tomato paste, and garam masala; cook, stirring frequently, until fragrant, about 3 minutes. Add crushed tomatoes, sugar, and salt; bring to boil. Reduce heat to medium-low, cover, and simmer for 15 minutes, stirring occasionally. At this point, allow the sauce to cool. Transfer the sauce into a storage container, cover and then refrigerate overnight. The next day, remove the chilled sauce from the fridge and heat up in a large dutch oven over medium heat. Stir in cream and return to simmer. Remove pan from heat and cover to keep warm. While sauce simmers, adjust oven rack to upper-middle position (about 6 inches from heating element) and heat broiler. Remove the chicken from the fridge and place on a parchment lined baking sheet. Place the yogurt coated chicken on the parchment lined baking sheet. Broil chicken until thickest parts register 160 degrees on instant-read thermometer and exterior is lightly charred in spots, 10 to 18 minutes, flipping chicken halfway through cooking. Let chicken rest 5 minutes, then cut into 1-inch chunks and stir into warm sauce (do not simmer chicken in sauce). Adjust seasoning with salt if needed. Before serving, stir in cilantro into the sauce or garnish with cilantro if using. This looks like a killer recipe for this dish. I'm saving for a later date. Thanks for sharing it and I like the look of your new blog. This is one of my favorite recipes. I'll have to try the adjusted instructions that make it more weekday-friendly. We love this recipe! Even my kids eat it. Sometimes I'll just make the yogurt chicken. Yum! There is a lot of contention over where this was invented, there are a couple places in Britain that claim to have done it first and even an Indian chef who claims it does have Indian roots. I eat this all the time, but have never made it from anything other than jarred sauces since I am new to Britain's curry culture. I will definitely try this recipe and scrap the jarred sauces! Yummie. I love chicken tikka masala . My favorite recipe is chicken tikka masala recipe . Try and let us know. 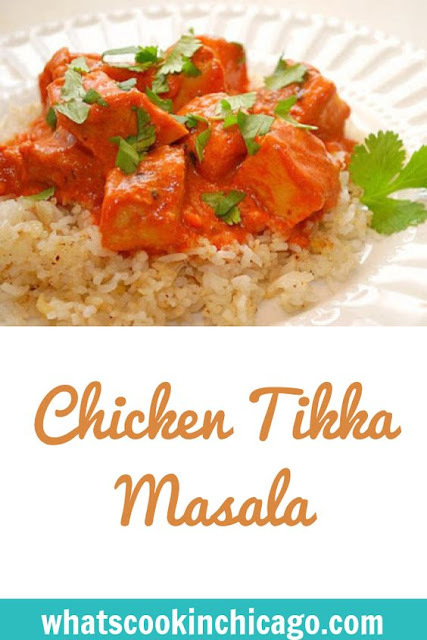 ymm.....i love chicken tikka masala..i got the recipe from here http://www.vahrehvah.com/Chicken+Tikka+Masala:3272 check it out..a real good one. I found this recipe via your freezer cooking post and was just wondering how you would change the prep if you were to freeze it? I 'm new to this whole freezer cooking thing! This is the most delicious recipe. I love how easy it is to make, and how special it tastes. ALL the family LOVES it, and I love making it! This is so delicious! Thank you!! So excited to try this!! It's my favorite dish ever!!! Do you have any hints on how to successfully freeze it? This was so good! It's one of my favorite Indian dishes and had previously failed with a diff. Recipe. Yours was so close to restaurant versions, even my husband enjoyed it. Thanks! I can't wait to try this! And thank you for allowing to print. Most blogs do not have this. I LOVED this recipe! Perfect! This page came up from a link to freezer meals and I have to say I am not sure at what point to freeze this meal. Thank you! Doing this right now. Thank you for the quick response. Would you prepare the sauce completely through the step where cream is added and then freeze? Or freeze sauce without cream and add it when you plan to eat it? Thank you! @Allison - I would freeze the sauce without the cream and add it when you reheat and are ready to eat/serve. Hope this helps! This recipe looks delicious! I mistakenly diced up the chicken before marinating and freezing it. I'm thinking the oven may not be the best way to cook the chicken now that it is diced, or would it still work but just for less time? What would you recommend? Could I dice chicken and marinate and make the sauce and cool completely and then put all ingredients together and freeze in a clip lock bag.and when ready to eat defrost and cook on low in a slow cooker ! Would this work and be ok as well ?